Beethoven’s sixteen string quartets are some of the most extraordinary and challenging pieces of music ever written. Originally composed and performed between 1798 and 1826, they have inspired artists of all kinds—not only musicians—and have been subject to endless reinterpretation. But what is it like to personally take up the challenge of these compositions, not only as a musician, but as a member of a quartet, where each player has ideas about style and expression? To answer this question, Edward Dusinberre, first violinist of the renowned Takács Quartet, offers a rare peek inside the workings of his ensemble, while providing an insightful history of the compositions and their performance. Founded in Hungary in 1975 and now based in Boulder, Colorado, the Takács is one of the world’s preeminent string quartets, and performances of Beethoven have been at the center of their work together for over forty years. Using the history of both the Takács Quartet and the Beethoven quartets as a foundation, Beethoven for a Later Age provides a backstage look at the daily life of a quartet, showing the necessary creative tension between individual and group and how four people can at the same time forge a lasting artistic connection and enjoy making music together over decades. The key, Dusinberre reveals, to a quartet crafting its own sound is in balancing continuity with change and experimentation—a theme that lies at the heart of Beethoven’s remarkable compositions. In an accessible style, suitable for novices and chamber music enthusiasts alike, Dusinberre illuminates the variety and contradictions of Beethoven's quartets, which were composed against the turbulent backdrop of the Napoleonic Wars and their aftermath, and he brings the technical aspects of the music to life. Beethoven for a Later Age vividly shows that creative engagement with Beethoven’s radical and brilliant quartets continues to be as stimulating now as it was for its first performers and audiences. Musicians and music lovers will be intrigued by Dusinberre’s exploration of the close collaboration at the heart of any great performance. 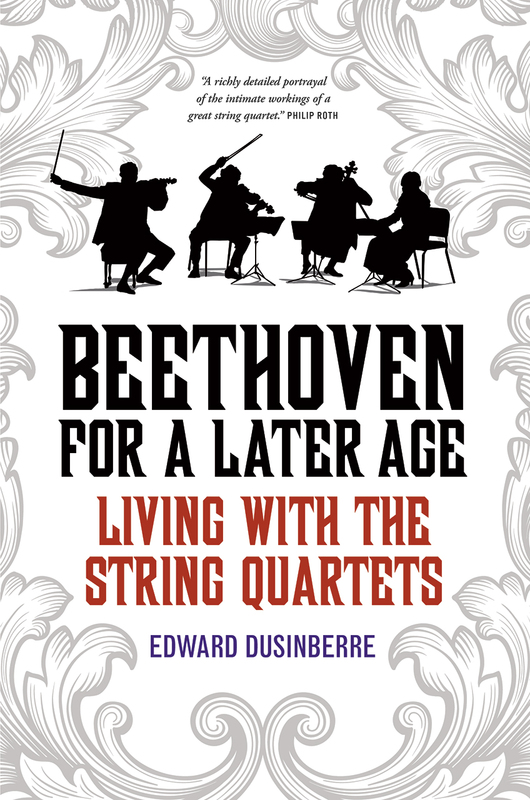 "I was able to delve even deeper into the music, thanks to a recent book about the quartets and how to play them, written by the [Takács] group’s first violinist, Edward Dusinberre. For anyone even remotely interested in the Beethoven string quartets, string quartets in general, or simply how music can enrich one’s life, I highly recommend following my example: buy the scores and study them, buy the book and read it, and listen to the music. Then listen again and again. You won’t regret it."